Summary (NBC): Robert challenges the Scranton branch to double sales — after a rousing motivational speech, Robert California challenges the office to double their sales. After the new manager promises the unthinkable, everyone in the office suddenly gets motivated to sell. Meanwhile, Pam finds an unlikely pregnancy friend. 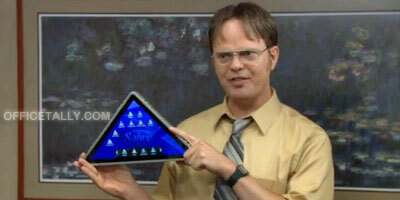 Introduced in The Office Season 8 episode, The Incentive, the Pyramid is a triangular-shaped tablet computing device produced by Sabre. Here’s Ed Helms’ visit to The Tonight Show last night! Part 1: Ed Helms on how wet suits are like super hero suits. Part 2: Ed Helms on being the new boss on The Office. Scene #3: Winners have a lunch club and the losers have a breakfast club. Scene #2: Ryan explains where trends comes from and what’s next. Scene #1: Andy tries to calm the troops. And don’t forget a clip of The Incentive was shown during Ed Helms’ appearance on The Tonight Show. A big thank you to everyone who tuned in for our Season 8 Premiere. I couldn’t be more proud of how the episode turned out. Big kuddos to BJ Novak who both wrote and directed the episode. I love when BJ directs – he’s great!!! Pam is pregnant again – and having a boy! And that was just the first five minutes! Angela and I are having SO MUCH FUN playing out the dueling pregnancy storyline together. There are some fun little moments in future episodes. We don’t dwell on it, but it provides some fun quips here and there. Now that I’m actually pregnant I can report with much authority that real pregnancy is WAY better than wearing one of those fake bellies for 12 hours a day. Poor Angela. She finally understands what I’d been complaining about. Those fake bellies cut in to your bladder so you have to pee all the time and you have to get totally undressed to use the restroom because they are like wearing a little wet suit under all your clothes. And you sweat! It’s awful! It’s funny – Angela finally has a BFF who she can talk to about real pregnancy and I finally have a BFF that I can talk to about fake pregnancy! Ha! It has been quite an adventure working while so very pregnant. I was nearly 8 months pregnant when we shot the Premiere. We’ve been working hard to shoot as many episodes as possible before I give birth and that has meant that I’m basically working up until my due date. Luckily, I feel great. I’ve been very fortunate. I haven’t had much pain at all. I credit my twice weekly weight training and nightly walks with my husband. The cast and crew have been so kind. They’ve taken such good care of me! I have to imagine it’s been good for our little guy to be around so much love and laughter each day. 1. Books: Girlfriend’s Guide to Pregnancy and Baby Bargains. Girlfriend’s Guide to Pregnancy is a great first read. In the beginning you can’t tell a lot of people about the pregnancy and this book is very comforting. Baby Bargains is a great resource for buying ALL baby related things. It gives consumer ratings for all of the big ticket items like cribs, strollers, baby bedding, car seats. I love it! 2. Clothes: Target, Pea in the Pod, Old Navy. Target has a GREAT maternity section. They have my favorite maternity tee shirts – Liz Lange. Love them! Live in them! Way better than the expensive ones you find other places. Target is also great for sleepwear. Nothing beats a great pair of designer maternity jeans and in my opinion it is worth the splurge so my advice is to go for Pea in the Pod. I loved the jeans and pants at Pea in the Pod. They also have a bathroom in the store and they give you water while you try things on…kind of a gold mine for the pregnant woman. For dresses I loved Old Navy Maternity. I was pregnant in the dead heat of summer and I lived in a couple of Old Navy dresses. They are affordable and cute! 3. Beauty Products: I know they say stretch marks are all about genetics but a girl can’t be too careful. I loved the Bella B Tummy Honey Butter. I used it every day and I don’t have stretch marks. I may have avoided stretch marks but I did not avoid the dreaded Pregnancy Mask. I got a bunch of large freckly splotches all over my face. I used Erase Paste by Benefit to cover the dark spots and then put my regular foundation over top. It was light, blended easily and covered up the dark splotches great! I’m very proud of this discovery! 4. Treats: Menchies Frozen Yogurt! Not only is it low calorie, it soothed my heartburn. Double treat! I also loved virgin Mojitos. When we would go to dinner with friends and everyone would order drinks, I would order a virgin Mojito. I loved the tart/minty flavor. 6. Exercise: I really credit regular exercise with my virtually pain-free pregnancy. For me, twice weekly light weight training and pre-natal yoga were key. There was a stretch of time when I couldn’t work out and I got very stiff, my joints hurt, my hips ached…it was awful. As soon as I was able to work out again, the pain went away. Exercise did more to ease my pain than massages or baths or any amount of rest. A body in motion, stays in motion! That’s about it! Can’t wait for you to see more of our upcoming season of the show. The next episode is called The Incentive. Robert tells Andy to double the sales in the office so he has to come up with some creative ways to get us motivated. It should be a good one!